Just to let everyone know that the purchase agreement on our new house got approved and we are set to close on 5/29. Woot! For those of you keeping score this will be house #3 that we have made an offer on in the last 2 years only to have everything fall apart. Here's to lucky number 3. It's been a while since I posted mainly because my new job gets me up in the wee hours of the morning and I'm semi-brain dead when I get home. Frankly, I should do it more because writing is not only cathartic, but it exercises all sorts of gray matter that most of us never use on a day-to-day basis. Well that and you find ways of starting sentences without using words like "basically", "essentially" and "frankly"... also you recognize that "irregardless" isn't a word. Go ahead, look it up, its not. You, gentle reader, will have noticed that the lives of my darling Wife and I have been complicated recently. My Mother has laid claim to the care and feeding of my niece, in her own private version of Pygmalion. I sincerely hope that my niece gets an opportunity to avoid some of the harsh mistakes that I had to live through when I was that age. However, I feel sure that, although I didn’t appreciate it fully at the time, being forced to suffer the consequences of my actions ushered me more swiftly into maturity than any tender embrace or kind word could have done. Not having raised anything more significant than your everyday Felius Catus to adulthood though, I fear that my experience in this field is somewhat anecdotal at best. My Mother will assure me that after having raised multiple teenagers, she is well equipped in this endeavor. I say good for her and wish her well in a noble cause. Contra spem spero. The complication has only developed because of a collection of reasons: misconceptions, inadequate standards, teenage mood swings and hurt feelings. It pains me to no end that our presence here is causing such angst and discomfort, so I resolved to do something about it. Ironically, literally only minutes before yesterday's blow-up I had just signed a purchase agreement on a nice house in Baton Rouge. After yesterday (and some of this morning) I had almost forgotten about it when I got a call from our realtor. The house is in a nice neighborhood in a desirable part of the city. The house is over priced and the owner bought it at the high point of the boom market and was upside down on the mortgage. It had sat on the market for months and the price hadn't budged. I placed an offer that I thought was reasonable and fully expected it to get rejected because it gave the seller a pretty big haircut. Imagine my surprise when my realtor called to let me know, in a very cheerful tone, that the seller had accepted my offer in principle. There are a few bugs to be ironed out, but I think we are just working on the small stuff in the deal now, not the big part... the one with all the commas and zeros in it. I don't want to jinx it, but we just might be getting out of here soon. I just hope Dixie can accept my apologies for it taking so long for us to get back on our feet. I will be forever indebted to her for everything she has done for us and we would not have made it this far without her. I only hope that all the bruised egos and hurt feelings will mend in time. This is the very last that Ann or I will have to say on the matter here. I know a house hunting blog entry was promised, but I just can't bring myself to do it. I have an absolutely amazing agent who has stuck by us for two years. Two years! Angela has been the epitome of patience and caring. She was with us in 2007 when we found our first dream house and made an offer. Two days later I was back at MDA being treated for PTLD. She was with us last year when we were about to close the deal on a great little garden home. The day we were supposed to sign the paperwork, I was in a hospital room at MDA getting the news that I had 74% blasts circulating in my blood stream and that the leukemia was back. Angela has stuck with us through thick and thin, always with a smile. She's constantly checking to be sure that I feel safe in any new environment and she's constantly making sure that I feel well enough to forge ahead. I'm happy to call her a friend and feel especially blessed to have her in my life. If you're planning on selling or buying a home, click on her name and check out her website. I promise you won't be disappointed if you choose her as your agent. I can't bring myself to talk about houses not because I've had any bad experiences seeing any. It's just that the ones that we've been interested in making offers on either go under contract before we can submit any paperwork, or get withdrawn from the market. This has happened three times since we started this. For those of you who have bought a home in BR recently, or even just looked, you know that the asking price per square foot is still higher than the national average. We always seem to find the houses owned by the least flexible individuals. C'est la vie. I'm also constantly looking over my shoulder as we pursue this for the third time. Pre-lymphoma, and relapse are pretty hard memories to shake. I have to believe that there's a reason things work out the way they do. On to brighter things, I think. I saw my local oncologist this morning and my counts are good. WBC's are 6.3, RBC's are 2.77, platelets are 240, and my ANC is 4.8. My liver enzymes and creatinine are still high, but they're headed in the right direction. I'll see my local doctor in a month for a routine check up, unless something happens. I don't see my transplant doctor until July. My eight month anniversary is next week. Maybe I'll be able to celebrate by picking out paint colors for a new house. Who knows? I am in complete molecular remission; no evidence of leukemia. The chimerism test is still out, so I don't know what percent donor I am. Dr. K. presented my case to the board and the consensus was that since there is no standard of care concerning my type of leukemia/translocation, they would be doing me more harm than good by giving me more chemo. The doctors want to ensure the health of my graft and let the transplant do what it's supposed to. They also don't know what to give me and how much of anything. My doctor reassured me that I'm 8 months out and that things look good. I've had the creeping suspicion that the medical powers that be didn't think that I'd make it out this far, let alone out of a second transplant. People, that chemo was rough. Well, here I am, almost 8 months later. Dr. K. went on to ask me if I had any new issues or concerns. I told her that the itchiness has picked up a lot and she was very pleased. GvH wins again. Seriously, the bottoms of my toes itched for 4 hours yesterday. I kept shuffling my feet over the carpet, hoping to get some relief, since you're really not supposed to scratch. The kooky neighbor across the street has probably labeled me the same thing for all of my weird shenanigans. I only have to check in with my local oncologist once a month now, which will be nice. I just saw him a little less than 2 weeks ago and I have another appointment next Tuesday. I'll keep that appointment and we'll just go from there. Chris and I have started house hunting again. I'll save that post for tomorrow, though. Got a call from my clinical nurse today. My transplant doctor will be calling me tomorrow to discuss my treatment going forward. If you all will recall, Dr. K. discussed placing me on maintenance chemo due to the super aggressive nature of my brand of leukemia. Since my next appointment at MDA isn't until July, I emailed the team to see what was going on. From what I gleaned, Dr. K. still hasn't decided on a course of action. I can't blame her since this is very new territory for all involved. I'll post after I speak to her tomorrow. I just wanted to drop in and say that all is well. There's currently no excitement, hence the lack of posts. There is an incident involving two cats, a mouse, and a coffee table that has become legend in my relationship with Chris. The first year we lived together, we adopted two cats from the pound, Trip and Squeeze. Trip was a very laid back British shorthair tortie that liked to do her own thing and only exerted herself when there was something smaller than her scurrying around. Squeeze was a very skittish sweet cat who showed obvious signs of abuse and neglect when we adopted her. I think she lived with us for six months before I could scratch her on the head without her having an aneurysm. Gradually, Squeeze warmed up to living with us and formed a little daily routine. She'd lay out on the cool concrete by our front door and occasionally go adventuring in our neighbor's vegetable garden. We lived in a tiny apartment that was part of a fourplex in the Garden District of Baton Rouge and the cats had the run of the postage stamp yard. When Squeeze was done lounging in the front yard, she would stand in front of our door and sing until someone let her in. One lazy Saturday afternoon while Trip lounged on the couch with me, I heard a muffled meow at the front door. Thinking nothing of it, I opened the front door to find Squeeze standing on the welcome mat expectantly. She wouldn't come in and kept looking up at me which started to worry me. Then I realized that her lower jaw looked deformed, as in grossly swollen. What I didn't realize was that she was holding a dead mouse in her mouth that just happened to be gray like her. She dropped the mouse at my feet and looked up at me with adoring eyes as if to say, "I brought you a gift. Don't you love it?" I stared down at the little rodent's carcass in horror. There were obvious puncture marks in its little body where Squeeze's teeth had just been and all I could do was wonder what the hell I was going to do with a dead mouse. Then it moved. I slammed the door in my poor cat's face only to scream in horror as the mouse wriggled into the apartment under the door. I jumped onto the coffee table screaming my head off because a one ounce mouse was desperately trying to escape from my precious cat. I must have screamed for Chris to bring Trip into the room because he burst through the door with the cat under his arm frantic to find out what was wrong. He nearly wet himself laughing when he saw the mouse. Trip managed to free herself from Chris and did what cats do best. The next thing I knew, Chris was opening the door and Trip was sauntering past Squeeze with her prize clutched in her mouth. Poor Squeeze was trying to bring me a gift and I completely freaked out on her. She never brought me another live gift again. Today, I was knitting quietly on the couch when I heard a frantic scratching at the front door. It was Dixie's cat, Pez, who never scratches or meows unless something's wrong. I threw the door open thinking that she was being chased by dogs only to have her charge in without so much as a by your leave. I had to step back or get trampled and when I did, my socked foot landed on something squishy. Pez was scratching at the door because she was desperately trying to catch a lizard. By opening the door, I had just allowed that lizard into the house. Still wondering what that squishy thing was? I screamed like a B movie starlet and slammed the door. The cats both freaked out and scattered. The lizard took advantage of the mayhem and escaped under the umbrella stand. I stood across the room throwing cat toys at the stand in the hopes of alerting one of the cats to the lizard's hiding place. They were still too freaked out by my screaming to do anything other than stare at me like I was crazy. Eventually I calmed down and let Pez go back outside. By the time I was calm enough to resume knitting, I spotted the lizard hiding in the corner of the room. I've seen what Etsuko does to lizards, and I didn't think I could stand to have it on my conscience if she caught this one. So I called Chris for a little encouragement and when he was done laughing he urged me to find a container to trap the little guy in so that I could release him outside. I put on rubber gloves and ignored Chris's advice to bundle up in an apron if I was worried about the lizard jumping on me. I placed a small deli container over the lizard and slid a plastic plate over the top. The neighbor must have thought I was nuts when I walked out onto the porch clutching plasticware, wearing gloves and talking to myself. I'm pleased to say that the lizard managed to jump into the garden and disappear into the undergrowth. Let it be a lesson to you all that I can face down cancer, but become a quivering mess when faced with something squirmy and small and scaly. Oddly enough, spiders and snakes don't bother me. Go figure. As I type this, a slightly overweight tonkinese is perched in my lap with her front forelegs crossed over one of my arms. She can't be comfortable, but she's determined. It's probably because I'm wearing black and she has a cat's sense of humor. I saw my local oncologist this morning to have a chemistry panel pulled, as requested by my transplant doctor. My CBC looks good. My RBC count is up just slightly, so maybe the new immune system is settling in and deciding to make reds. My platelets are up a little at 269 and my WBC is 7.6. I always get a little antsy when the white blood cells creep over 7. I just keep waiting for that explosion that heralds leukemia. My alk phos was still elevated, but slightly lower than last week and my creatinin was 1.0 compared to 1.2. This is still high for me, but Dr. Bienvenu thinks things are headed in the right direction. All of this new information is being faxed to my transplant team today. They'll put together a plan of action and probably call me. Or not. I never know. Unless I hear otherwise, I'll be seeing Dr. Bienvenu again in two weeks. I spiked a small fever last night which upset Chris, but taught us both something new about my resident immune system. There was quite a bit of drama last night thanks to the resident teenager and after three months of remaining silent on the matter my temper exploded. I have a very slow fuse and a desire to stay out of other people's messes, but when you bring the mess to my doorstep I get a little crazy. After a double round of door slamming and I don't know how many rounds of foot stomping I heard a raised voice coming from the bedroom connected to ours. It was late and I was already irritated from a week of the same thing so I jumped up to confront the situation. Chris stopped me, which was for the best, but before I could stop myself I yelled at the teenager through the wall which resulted in another round of stomping and another door slam to be followed by a little more drama. Why have I shared all of this? Because I take my temperature right before going to bed and this little incident just happened to coincide with my bed time. I was aggravated beyond reason which affected both my blood pressure and my temperature. Voila, fever. I'm very happy to report that the temperature is back to normal this morning. The teenager, not so much. Stomp-stomp, slam. I received an urgent request to post some information about a precious little girl who is in need of a bone marrow transplant. 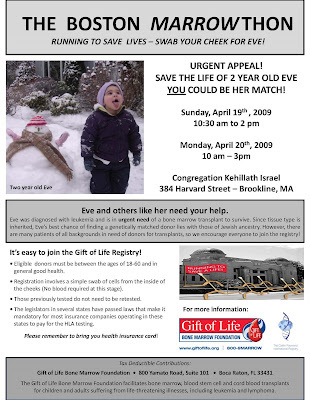 Her name is Eve and she doesn't have an HLA match on the registry. An emergency bone marrow drive is being held in Boston in the hopes of finding her a match. If you're in the area or even close, please take the time to go get tested. It's absolutely painless and only involves getting the inside of your cheek swabbed. That's it. You may save a life one day. Wouldn't that be worth a few minutes of your time? I wouldn't be here right now if not for a very generous woman half way around the world who took the time to donate bone marrow to me. So please, get the word out. Click on the link below for dates and times. Sorry I was so cryptic in yesterday's post. I was still tired from the day before and was having a hard time organizing my thoughts. For the most part, my CBC numbers were normal with the exception of a liver enzyme and my creatinine level. My baseline creatinine is usually .6, but on Monday it was 1.2. I asked my doctor if I could be dehydrated since creatinine levels correlate to the kidneys. She didn't think so based on my other numbers. I have to go see my local oncologist next week to have another chemistry panel pulled to see if these numbers start behaving. Dr. K. said that the elevated liver enzyme could be due to Valtrex. I find it funny that I've been taking this drug off and on for over two years and it's just now starting to give me problems. I still don't have any preliminary results from the bone marrow biopsy. Chris and I are just waiting to hear what percentage of blasts my marrow shows. Less than five percent is still considered cancer free. I'm hoping for zero. A new P.A. performed the procedure and although she was nice and expeditious, she still managed to puncture my hip bone at just the right angle to be extremely painful. On a good day, bone marrow aspirations are uncomfortable. When Teri or Tommy do them, they are an absolute breeze. On Monday, each time the P.A. pulled marrow out my right leg would start to shake uncontrollably and I could feel my heart pounding against my ribcage. She stopped and asked if everything was okay and I told her to keep going just to get it over with. I know from experience that there is nothing to be done if the needle comes in at the wrong angle. On a positive note, she said that both the marrow and bone samples were excellent. Thank God for small victories. Because you have to wait 48 hours before getting the puncture site wet, I have another hour and a half left before I can shower. I am miserable sitting in my own filth. It's an exaggeration, but I would dearly love a hot shower and to be able to shampoo what little hair I have. It's currently sticking up in pointy little wisps. During my meeting with Dr. K. I got looked over for GvHD. My joint flexibility is still good and the strange brown spots on my leg are still missing. My skin is constantly itchy, but I will gladly suffer through it not to be on oral steroids. I'm still retaining a bit of fluid which concerns my doctor. I learned that the fluid can cause a hardening of the tissue which is another manifestation of GvHD. It would mean that my face and abdomen would be permanently distorted. I definitely did not groove on that little bit of information. I like to think that I'm a minimally vain individual, but I don't aspire to look like Quagmire on a permanent basis. The one part of the visit that caught me off guard was the mention of additional chemotherapy. I don't know why I thought having a second transplant would be the end of things, but I did. When Dr. K. started talking about maintenance chemo, I think my brain leaked out of my ear. There is no standard of care when dealing with chemo post transplant for ALL t:(4;11). There aren't that many adults who have survived it and so there aren't that many successful studies out there. She mentioned Vidaza, which is a maintenance chemo given for AML, but there's no conclusive proof that it would be helpful. Another monoclonal antibody was mentioned, but she admitted that she wouldn't even know how much to dose me. We're essentially wading into very new territory. I was told that if I'm going to relapse again, it will most likely happen in the first 12 months following transplant. I'm at month 7. The idea behind maintenance chemo is to give me a fighting chance to beat this thing. I was reminded of how aggressive this type of leukemia is and how very in the dark we are about it's treatment. My doctor is presenting my case to the other transplant doctors next week in the hopes of coming up with a firm treatment plan for maintenance. I've been handled by half a dozen of the transplant docs and know that there are some stellar intellects on the team. I just hope that one of them hits upon the right combination of chemicals to keep me cancer free. So now you all have it. I'm still having a hard time with the idea of receiving more chemo after the last two years, but I'll come to terms with it. I'll be on pins and needles until I get that preliminary report, which I hope will come in today. As soon as I know something, I'll post. Just a short post to let everyone know what's going on. I had appointments at MDA yesterday and it was a very long day. I had a bone marrow biopsy and a meeting with my transplant doctor. I don't have any preliminary results from the BMB, but I'm hoping to hear something tomorrow. My doctor brought up a few things in our meeting that took me off guard. I'm still letting the information percolate, so I'll talk more about it tomorrow. Right now, my hip is killing me from the procedure yesterday, so I'll have to say good night. I feel infinitely better compared to yesterday. I'm not taking any chances, though, and decided to expend the minimum amount of energy necessary. As I had guessed, my transplant team wanted me to keep doing what I was doing and only go into the ER if I spiked a fever. So far, my temperature has remained steady. Well, it happened. I have been laid low by whatever was infesting my niece. It all started early this afternoon with a bit of congestion and sinus pressure. I attributed my discomfort to the front that moved in over night. My post nasal drip steadily got worse during the day and I began to feel nauseated. By the time dinner rolled around, I was pretty sure food would be the enemy. I managed to eat half of a sandwich and a handful of chips before the nausea really dug its claws in. Chris suggested that I take a Zofran, which I did. I managed to eat two popsicles after this and thought that I was really in the clear. Not so. I ended up vomiting about 15 minutes later. I did feel immensely better after this little episode. I plan on emailing my doctor and waiting on further instructions. I haven't spiked a fever and my temperature has been consistent all day. I already have an appointment in Houston on Monday, so I suspect that the team will keep me in a holding pattern unless my symptoms get worse.